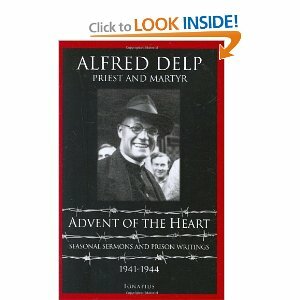 I just downloaded the Kindle edition of Advent of the Heart: Seasonal Sermons and Prison Writings 1941-1944 by Fr. Alfred Delp. Fr. Delp was imprisoned by the Nazis and held in solitary confinement. He was tortured and executed on February 2,1945. While imprisoned he wrote brief meditations and was able to smuggle them out of prison. More and on a deeper level than before, we really know this time that all of life is Advent. Yes. It is time to wake up, to pray, repent, and turn our hearts and minds to the Lord as we wait in joyful hope. This entry was posted in Four Last Things, Liturgical Year and tagged Alfred Delp. Bookmark the permalink. Wow I think I will have to use that for next week’s RCIA lesson on Four Last Things! A little more uplifting than Dante but still on point.